Frugal2Fab Instagram has been flooding with questions. One question in particular. Anushree Reddy Lehengas cost. Can Who is the designer and so on. So I thought lets just address the issue from A to Z all about Anushree Reddy Lehengas. Anushree Reddy is an Indian Bridal Lehenga designer specialising in Bridal Wear. Her designs are all about elegance and romance in traditional Indian wear. In one line, Anushree Reddy is the queen of floral lehengas. By now you would know that Anushree Reddy Lehengas choice of colours are very feminine. So lots of pinks, reds, yellows in florals and buttis. Anushree Reddy Lehengas has taken the bridal fashion by storm. Her designs appeal to all segments from brides, sister of the bride & groom, as prewedding outfits. She even has lehengas for wedding guests. There is something for everyone in here. Anushree Reddy Lehengas are always full flared. Her brides always get that princess like feel when they twirl in their dream outfits. If you are into whimsical looks, and dreamy weddings, then Anushree Reddy Lehengas are the perfect pick for you. Whether it is your sangeet or mehendi, Anushree Reddy Lehengas look drop dead gorgeous for any day wedding functions. Bright and colourful, she is one designer to watch out in bridal fashion. Anushree Reddy signature cotton candy pink lehengas are such a rage since some time now. Almost every second or third bride out there is opting for this look for their prewedding functions. Very feminine, these outfits almost make the bride look a younger version of herself. 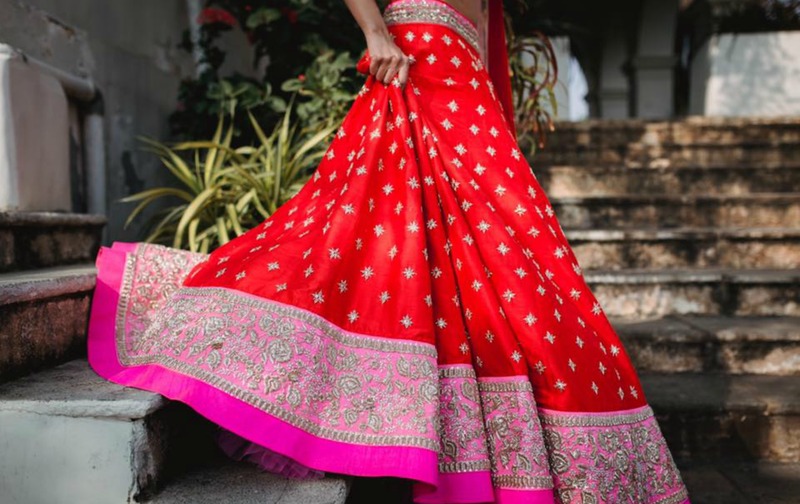 What do Anushree Reddy Lehengas cost?